Stanley Wojcicki is Professor Emeritus at Stanford University (2010-present). His research interests include experimental particle physics, high energy physics and neutrino oscillations. March 30, 1937Birth, Warsaw (Poland). 1957Obtained AB, Harvard University, Cambridge (Mass.). 1961Obtained PhD in Physics, University of California, Berkeley, Berkeley (Calif.). 1961 – 1964Physicist, Lawrence Berkeley National Laboratory. 1964National Science Foundation (NSF) Fellow, European Organization for Nuclear Research (CERN). 1964National Science Foundation (NSF) Fellow, Collège de France. 1965Physicist, Lawrence Berkeley National Laboratory. 1966 – presentAssistant Professor of Physics (1966-1968); Associate Professor of Physics (1968-1974); Professor of Physics (1974-2016); Chair, Department of Physics (1982-1985 and 2004-2007); and Professor Emeritus (2010-present), Stanford University, Stanford (Calif.). 1969 – 1970Member, Users' Executive Committee, Fermi National Accelerator Laboratory. 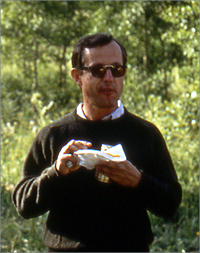 1972 – 1974Member (1972-1974) and Chair (1974), Program Advisory Committee, Fermi National Accelerator Laboratory. 1973 – 1974Guggenheim Fellow, European Organization for Nuclear Research (CERN). 1977 – 1978Member, Program Advisory Committee, Stanford Linear Accelerator Center (SLAC). 1978 – 1980Member, Users' Executive Committee, Fermi National Accelerator Laboratory. 1978 – 1980Member, High Energy Visiting Committee, Lawrence Berkeley National Laboratory. 1979 – 1981Chair, Experimental Program Advisory Committee, Stanford Linear Accelerator Center (SLAC). 1980 – 1981Alexander von Humboldt Foundation Senior Scientist, European Organization for Nuclear Research (CERN). 1982 – 1984Member, Visiting Committee, Fermi National Accelerator Laboratory. 1982 – 1985Member, Board of Trustees, Associated Universities, Inc.
1983Chair, Subpanel on New Facilities, High Energy Physics Advisory Panel, United States Department of Energy. 1984Member, Board of Overseers, Superconducting Super Collider. 1984 – 1989Deputy Director, Central Design Group, Superconducting Super Collider. 1985 – 1991Member, Council (1985-1989); Member, Executive Committee, Division of Particles and Fields (1990-1991); Member, Council (1990-1992); and Member, Executive Board (1991), American Physical Society. 1985 – 1996Member (1985-1989) and Chair (1990-1996), High Energy Physics Advisory Panel, United States Department of Energy. 1986 – 1991Member (1986-1991) and Chair (1989-1990), Advisory Committee for Physics, National Science Foundation. 1987 – 1989Member, Program Advisory Committee, Continuous Electron Beam Accelerator Facility (CEBAF). 1988Member, NAS-NAE Site Selection Committee, Superconducting Super Collider. 1991 – 1992Member, Task Force on Energy Research Priorities, Advisory Board to the Secretary, United States Department of Energy. 1992 – 1996Member, Scientific Advisory Committee, National Institute for Nuclear and High Energy Physics (NIKHEF), Amsterdam. 1993Visiting Scientist, Superconducting Super Collider. 1996 – 1997Visiting Scientist, Fermi National Accelerator Laboratory. 1999 – 2003Visiting Scientist, Fermi National Accelerator Laboratory. 2001 – 2003Member, International Committee for Future Accelerators. 2002Chair, Division of Particles and Fields, American Physical Society. 2003Member, High Energy Physics Advisory Panel, United States Department of Energy. PhD advisor at University of California, Berkeley, "Pion-hyperon Resonances." PhD advisor at University of California, Berkeley. National Science Foundation (NSF) Fellow; Guggenheim Fellow; and Alexander von Humboldt Foundation Senior Scientist. Assistant Professor of Physics; Associate Professor of Physics; Professor of Physics; Department Chair; and Emeritus Professor. Deputy Director, Central Design Group; Visiting Scientist; Member, Board of Overseers; and Member, NAS-NAE Site Selection Committee. Fellow; Member, Council; Member, Executive Committee, Division of Particles and Fields; Member, Executive Board; and Chair, Division of Particles and Fields. Visiting Scientist; Member, Users' Executive Committee; Member and Chair, Program Advisory Committee; and Member, Visiting Committee. Member, High Energy Visiting Committee. Member and Chair, Advisory Committee for Physics. Member, Program Advisory Committee and Chair, Experimental Program Advisory Committee. Chair, Subpanel on New Facilities, High Energy Physics Advisory Panel; Member and Chair, High Energy Physics Advisory Panel; and Member, Task Force on Energy Research Priorities, Advisory to the Secretary. Obtained PhD in Physics (1961). History of MURA [Midwestern Universities Research Association], Fermilab and the SSC [Superconducting Super Collider] [sound recording], 2009 May 4. Oral history interviews. High-Energy Physics. Selected Experiments: BNL-E-791: Study of Very Rare K-Long Decays, 1990-1991. Working with Luis Alvarez (1911-1988) [sound recording], 2011 May 3.